Location: Blarney, County Cork, Ireland. Notes: Blarney Castle is a medieval stronghold in Blarney, near Cork, Ireland, and the River Martin. Though earlier fortifications were built on the same spot, the current keep was built by the MacCarthy of Muskerry dynasty, a cadet branch of the Kings of Desmond, and dates from 1446. 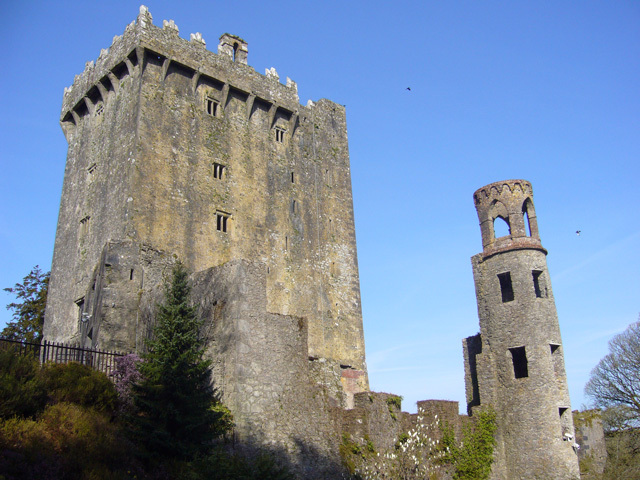 The Blarney Stone is among the machicolations of the castle. The castle is now a partial ruin with some accessible rooms and battlements. At the top of the castle lies the Stone of Eloquence, better known as the Blarney Stone. Tourists visiting Blarney Castle may hang upside-down over a sheer drop to kiss the stone, which is said to give the gift of eloquence. There are many versions of the origin of the stone, including a claim that it was the Lia Fail - a numinous stone upon which Irish kings were crowned. Surrounding the castle are extensive gardens. There are paths touring the grounds with signs pointing out the various attractions such as several natural rock formations with fanciful names such as Druid's Circle, Witch's Cave and the Wishing Steps. The grounds include a poison garden with a number of poisonous plants, including wolfsbane, mandrake, ricin, opium and cannabis. Blarney House, also open to the public, is a Scottish baronial-style mansion that was built on the grounds in 1874.